The organization of computing and information technology (CIT) in academe is undergoing a dramatic transformation. At an accelerating rate, Computing and Information Technology (CIT) programs are being organized into schools and colleges,1 rather than departments. Figure 1, based upon data from a survey of recent CIT developments, provides an initial sense of the growing pace of this transformation. For those schools and colleges formed through separation from an existing college, over 40 years passed between the first and second separation. After seven more years, two more CIT colleges were created. However, between 1997 and 2001, eight departments were upgraded via separation. In addition, 10 schools/colleges not shown in Figure 1 were formed by mergers, originary organization or other processes. The issues of greatest interest to CIT professionals are: 1) reasons underlying the trend, 2) possible changes, accompanying the shift, in how CIT will be organized and administered in the future, and 3) whether the objectives of academic units that are thus reorganizing themselves are being realized. The present discussion seeks to draw upon recently collected survey data to provide an early view of what the evolving profession is trying to accomplish, and the extent to which it is succeeding. The first set of questions concerned the scale of CIT unit operations. As Table 1 shows, their operating budgets range from a few hundred thousand dollars to over seventy-five million; their external funding ranges from none to $58 million; they have between 8,500 and 250,000 square feet of space. Figure 2 provides a view of the scale of the colleges responding to the survey. 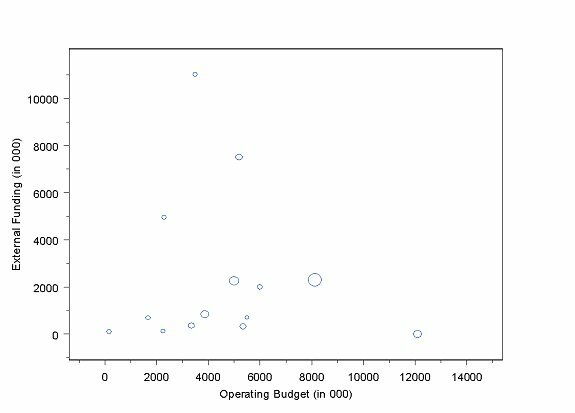 One respondent college is a large outlier in both operating budget and external funding, and its data has been removed from the graph in order to give a more intuitive sense of the scale factors of the other respondents. Another sense of scale is provided by the number of majors that the colleges have, and the number of credit hours the programs produce. The number of majors ranges from five to 4,200 (mean=755); The number of credit hours generated ranges from 140 to 55,435 (mean=13,106). As one would expect, the relationship between number of majors and credit hour production are highly correlated. Separating units emerged from various colleges. 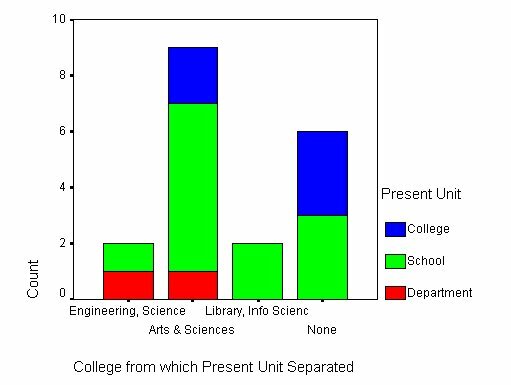 Figure 3 shows which colleges the new programs separated from, and the nature of the present unit. It can be seen that the largest group emerged from Arts & Sciences, Liberal Arts, etc. The second largest category is none, which includes these responses to the question, "What College was your department in before the separation?" Figure 3 also indicates that CIT schools are more prevalent than colleges. Even though the new units differ in both how they were created and the nature of the present unit, they are highly similar in their reporting structure. The vast majority of responding units (16 of 19) reports to either the Provost or the Vice Chancellor. 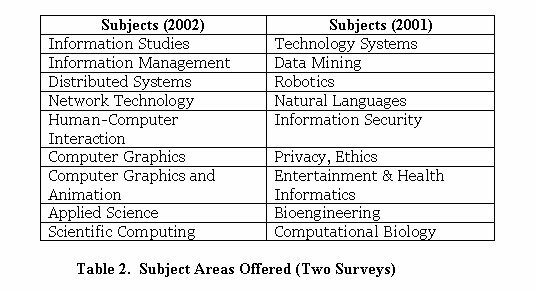 A wide range of subject areas is being taught in CIT schools and colleges as summarized in Figure 4, including a range of computer science, engineering and information systems topics, as well as more specialized subjects such as electronic commerce and educational technology. Respondents were also asked to provide additional subjects offered by their program. These topics are listed in the first column of Table 2. This list of CIT specialties should not be regarded as complete. For example, respondents proffered other subjects in the first survey reported by Berghel (2001). 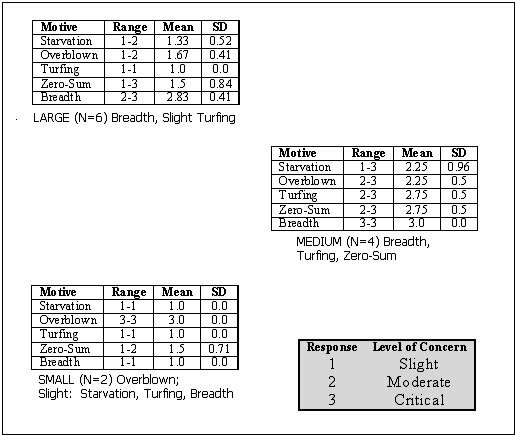 These are listed in the second column of Table 2. However, as discussed below, it is unlikely that all of the reported subject areas, those listed in the questionnaire and those volunteered in both years, exhaust emerging CIT subject areas. 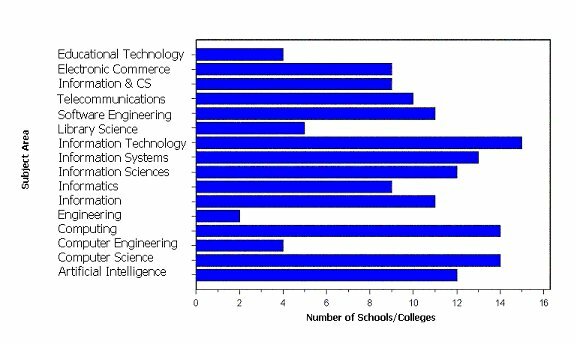 This breadth and diversity of subject areas suggests that the process of CIT program evolution has yet to slow down or stabilize. The future content of emerging schools and colleges will be shaped, in part, by the professional discourse now under way among the faculty, administrators and constituencies of participating universities. While the general trends are strikingly similar, the reorganization of each unit has its own history and context. It is therefore interesting, and potentially significant, to explore the profile and motivation underlying the move toward autonomy. Five possible motives arose from informal discussions with the participants at the first CRA workshop held at Snowbird in July, 2000 and was included in the surveys. In response to the five motives, presented in Table 3, respondents indicated whether each motive was of slight moderate or critical concern. Twelve of the 22 respondents (the same number who specified an actual year of separation) indicated the relative importance of these motives.3 The multiple priorities among motives selected by various respondents are complex, of course, but clustering helps to isolate broad patterns. Specifically, as summarized in Figure 5, cluster analysis generates three distinct patterns of motives. The range and mean of the responses suggest the level of concern for a particular motive (see legend embedded in Figure 5), while the standard deviation provides insight on the level of consensus within the cluster. A standard deviation of zero indicates complete agreement on a particular motive. Not surprisingly, the smallest cluster has the greatest consensus. Specifically, both respondents regard Overblown Department as the motive of critical concern, and other motives are of slight or minor concern. As would be expected, the largest cluster is more diffuse in its priorities. However, all agree that Turfing is of only slight concern, and five of the six respondents consider Mission Breadth to be of critical concern. The middle cluster has a consensus that Mission Breadth is of critical concern, but (unlike LARGE) also consider Turfing and Zero-Sum to be of high concern. While the clusters are based upon patterns of separation motives, they are related to other factors as well. Applying analysis of variance4 to previously discussed variables reveals that the relationship between the motive clusters and several analyzed variables is statistically significant, specifically the variables Majors, Credit Hours, Year of Separation, and Operating Budget. The relationship between Credit Hours and the motive clusters is significant beyond the .001 level, unusual strength for such a small sample. More generally, these results suggest there is a substantive relationship between the motives for separation and operational characteristics of the separating unit. A closer examination of these relationships reveals other patterns of interest. The SMALL cluster is composed of two programs that separated relatively early (1988 & 1995), and now produce more than twice as many credit hours as the next largest programs. These schools agree that their size prior to separation dwarfed sibling departments without a corresponding increase in resources (Overblown Department). From a policy viewpoint, it seems likely that they experienced the problem of "growth outrunning resources" earliest. They were, in effect, "leading the pack" in motivating the need to separate. In addition to the motives suggested by the questionnaire, in both years respondents were invited to provide additional motives. The diversity of these responses, summarized5 in the bullet points listed below, provide a sense of the variegated histories underlying the emergence of CIT schools and colleges. The library school was closed down. My school was created to replace it. The interdisciplinary program was created from whole cloth. The university identified the area as strategically vital, and faculty committees recommended. A bold statement of a new direction, expansion and transformation. "mission visibility and focus"-units needed to be recognized as forming a mega-discipline, e.g., computing and focus on "computing" in the same way all engineers focus on "engineering"
Chancellor wanted new unit with specific mission so as to be able to allocate and attract resources; IT College concept to make one-stop shop. Two smaller units combined to create a school with new direction and focus. The data reported here make it appear that there is a paradigm shift in how CIT programs are being organized. New schools and colleges are being created at an accelerating rate, and this is clearly not a chance occurrence. The data suggest that these innovating programs face similar problems, and have similar motivations for their reorganization. Analysis of emerging units suggests that there are several motive clusters, and these are related, at a statistically significant level, with vital operational variables such as number of majors and credit hour production. The strength of these relationships is especially striking given the small number of responses included in the calculation. It is our experience that the addition of new CIT cognate areas is being driven more by external stakeholders and new constituencies than by interests within the academic community. To illustrate, genomics within bioinformatics was originally driven by the availability of NIH funding from the human genome project, and complemented by the initiatives of entrepreneurs. The same may be said of computer graphics and animation, robotics, data mining and many other areas. Rapidly expanding or emerging areas must have access to research and innovation, as well as professionals with unique or enhanced skill sets, to realize their potential. This demand is the fuel that powers the rapid creation of new academic projects, programs and, ultimately, disciplines. In fact, the goals and objectives of these emerging units are less defined by discipline, than by the level of institutional responsiveness. Informally, it appears that the continual development and growing availability of novel information technologies creates pressures for innovation within the university, and frequently these pressures are inadequately addressed by inflexible, traditional disciplinary structures and boundaries. As an illustration, the emergence of bioinformatics is often motivated by academic issues of considerable currency that are neither being addressed by biology nor the computing sciences. Similarly, information assurance and security curricula, generated by a combination of practical concerns, mathematics and technological innovation, originally had no place in conventional curricula. Electronic commerce spans computing, business, policy sciences, economics, humanities and the fine arts, without being anchored in any one of them. In each of these cases, traditional academic organization leaves mission-critical subject areas of the future homeless. The data reported here show that a number of progressive and aggressive universities are willing to tear down academic barriers that impede the responsiveness to the demands of new constituencies, and reorganize their programmatic offerings and research foci. Their objectives include accommodating the evolving interests of internal and external stakeholders, redefining their missions in order to aggressively pursue understanding of the intellectual implications of new realities, and produce the greatest potential social benefits. The futures of these universities are to be built upon recombinant disciplines rather than entrenched academic silos. For those willing to proceed down this path, there is considerable risk but, at the same time, enormous opportunities. Those universities that can successfully anticipate this computational 'fitness landscape' will enjoy a considerable competitive advantage over those that waste time and energy trying to repurpose traditional disciplines that are ill-suited to the task. No one can be sure where the greatest benefits of the present intellectual upheaval may ultimately be found, but openness and adaptability appear to be key to navigating through technology uncertainty and academic misalignment. As evidenced by the variegated strategies and directions described by our respondents, CIT appears to be in the upheaval phase of an academic punctuated equilibrium (Eldridge & Gould 1972). The next set of issues will be to organize the new colleges in a coherent, sustainable way. Given the range of disciplines, priorities and localities, initial structures are apt to be diffuse and subject to further evolution. Without a reflective dialog among the relevant disciplines and constituencies, there is a danger of fragmentation and instability, resulting in a rolling paradigm shift that fails to converge. Accordingly, elicitation of such a dialog is one of the objectives of the present study. The reorganization of CIT colleges and schools will be complex, and decision-makers will face many choices and tradeoffs. As evident from the data reported here, university priorities and CIT unit history vary widely. Notwithstanding such differences, all CIT colleges will need to clarify three types of relationships, specifically, between CIT and: 1) its original home (or target academic community), 2) the applied sciences (e.g., public policy, business, health, law enforcement), many of which have links to stakeholders and constituencies that are external to the universities, and 3) the basic sciences. The prior departments of emerging CIT units come from various colleges (e.g., arts and sciences, engineering, library science, and business), and/or serve emerging constituencies. Regarding this first it is frequently an act of creative synthesis to integrate the needs of these constituencies into a common program. A balance is necessary between the unique requirements of prior disciplinary priorities and opportunities inherent in convergent synergies. This is true even if the new program was intentionally designed to meet specific, emerging needs. Informatics is a concept that is diversely relevant to the applied sciences, and thus to the second relationship. Specialized forms of informatics have arisen to facilitate decision-making in areas such as medicine, health, battlefield management, law enforcement and entertainment (Hamelink 1988), and the list can only be expected to grow. Because of stakeholder interest, applied areas provide one of the faster growing CIT cognate areas. Another growing area of outreach is based on the third relationship, between CIT and the basic sciences. Computational physics, with its requirement of parallel numerical models, has become the prototype for computation science, the generic description of the melding of applied computer science and a substantive area. However, the needs of each scientific discipline are unique. Bioinformatics provides another distinct exemplar of a CIT cognate area, with a different set of computational requirements. Although social informatics is at a less mature stage than its counterparts in the natural sciences, recent work in multiagent simulation (Macy & Willer 2002) suggests computational social science as another potentially fertile focus for interdisciplinary CIT. Regardless of disciplinary focus, the relationship between CIT schools and basic and applied sciences has the potential to provide a common organizational structure. Local interdisciplinary cooperation will permit development of technical, methodological departments that provide support to the relevant disciplines while, at the same time, retaining a specialized computational research program. The three relationships are somewhat intertwined, of course. Many policy science models depend upon and would benefit from advances in basic science informatics. A focus on homeland security, for example, could easily draw on computational models from the physical, biomedical and social sciences (Teigh et al. 2002). However, in prioritizing the focus of their evolving programs, CIT decision-makers inevitably must address issues of how best to fuse such resources. There will also be complementarities that are identified as mutually reinforcing. As one example, natural language and web semantics have the potential to span artificial intelligence and the policy sciences. The affinities between genomics and data mining serve as another example. These complementarities, and others like them, provide potential foci for program priorities, topics for ongoing professional dialog and eventual CIT organizational and curricular standards. Ten years ago it would be anathema to consider such a program. Now it's about to become mainstream." Our survey supports this conclusion. Computing and Information Technology is undergoing a demand-side transformation in the way its curricula are organized and delivered. The relevance of computing for many ancillary disciplines and a number of cross-disciplinary areas has resulted in the projection of computing content into new and different organizational forms. Frequently, the mission of such innovative areas includes strategic research partnerships with external stakeholders. A growing organizational response to this proliferation has been for universities to create CIT schools and colleges, often with unusual names, and unprecedented mandates, which synthesize and reassemble programmatic offerings. Frequently, such units have been achieved by existing departments separating from existing colleges, but sometimes it is the result of merger, or the design of an entirely new unit. The impetus to reorganization has most commonly been either growth that outruns available resources, or a mission broadened beyond what can be accommodated within a traditional department. Through whatever realignment process, conventional academic structures and boundaries have been redefined and, thus, softened or eliminated. The present analysis has documented this radical organizational realignment. As Abbott (1995) has shown, the emergence of a new field is frequently fluid, inchoate, and diversely defined until the process of self-organization matures. It is our intention and hope that the patterns reported here will be helpful to academic decision-makers who are working together to achieve an effective and sustainable organization of the computational and information sciences in academe. Abbott, Andrew. 1995. Things of boundaries. Social Research 62(4), pp. 857-881. Berghel, Hal. 2001. A preliminary survey of colleges of computing and information technology. Presentation to the Computing Research Association (CRA) Information Technology Deans' Workshop. Berkeley, CA. Denning, Peter. 2001. The IT Schools Movement. Communications of the ACM 44 (August): 19-25. Eldredge, Niles & Stephen J. Gould. 1972. Punctuated equilibria: An alternative to Phyletic/Gradualism. Pp.82-115 in T. Schopf, ed., Models in Paleobiology. San Francisco: Freeman Cooper. Hamelink, Cees J. 1988. The Technology Gamble: Informatics and Public Policy. Norwood, NJ: Ablex Publishing Corporation. Macy, Michael W. & Robert Willer. 2002. From factors to actors: Computational sociology and agent-based modeling. Annual Review of Sociology 28, forthcoming. Teigh, Jonathan M., Michael M. Wagner, Colin F. Mackenzie & Klaus O. Schafer. 2002. The informatics response in disaster, terrorism and war. Journal of the American Medical Informatics Association 9 (March/April):97-104. * The authors are grateful to Bill Aspray, Peter Freeman and Harriet Sallach for assistance at various stages of this study, and Jiang Hong Song for implementing the online CGI surveys designed by the first author. 1Academic units included in this category are defined as those reporting to the Provost level or higher. 2Not all respondents answered all questions. 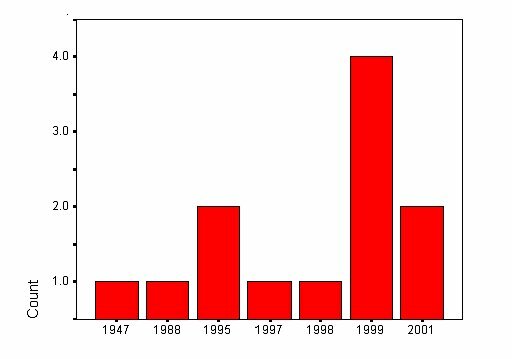 Since non-responses are not included in the statistics and graphs reported here, the number of cases in the various tables and figures varies from 12 to 21. The statistical tests used to analyze the data are descriptive, rather than inferential. 3 No cluster configuration that yielded a singleton cluster was accepted. Within that constraint, the three cluster solution produced the highest average silhouette width. The same three clusters are produced by both the hierarchical agglomerative and K-Means partitioning methods. 5The twelve individual responses summarized in the bullet points are quoted as submitted except for the excision of identifying references.